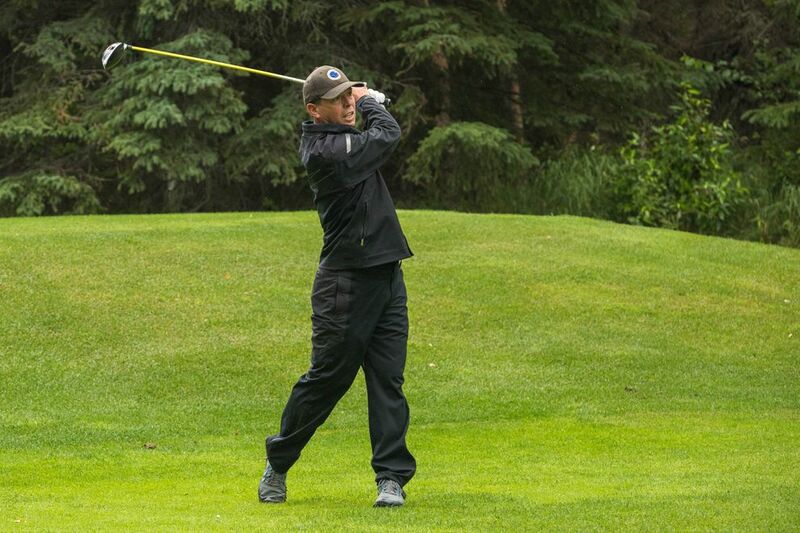 An eagle on the ninth hole at Anchorage Golf Course sent Greg Sanders soaring into the first-day lead at the Alaska state amateur golf tournament Thursday. 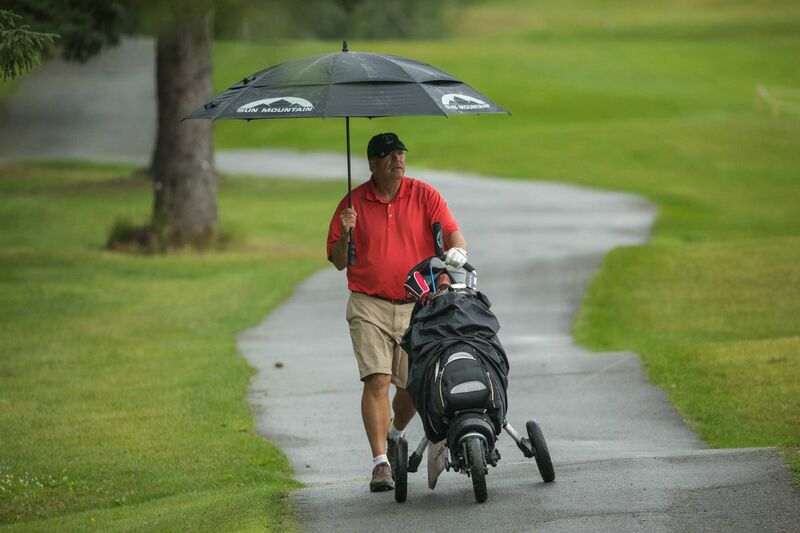 Sanders, a five-time champ, fired a five-under-par 67 on a wet day at Anchorage Golf Course to seize a three-stroke lead over Craig Burnham. Jordan Miller, the winner of the last two state championships, is in third place at 71. It didn't rain hard but it was wet for much of the day. Sanders was on fire, carding birdies on four holes to go with the eagle. He finished the front nine with a 4-under 32, scoring his eagle on the 478-yard, par-5 ninth hole. 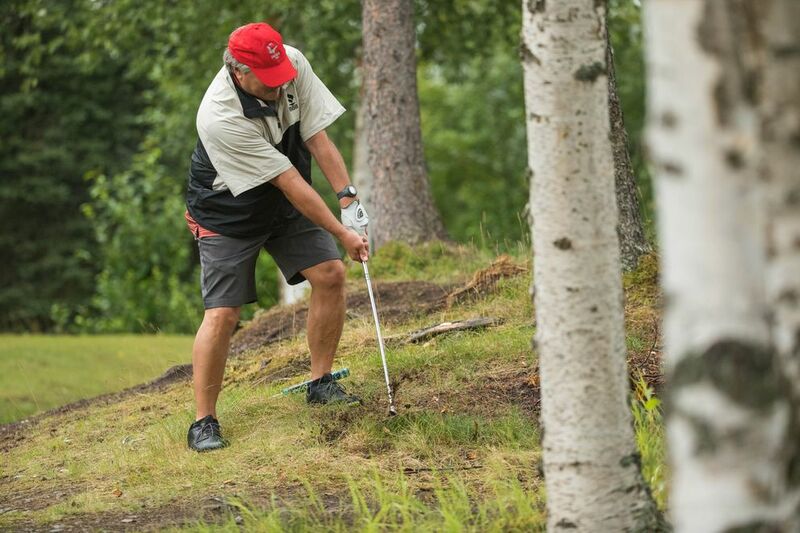 His only bogey came on the very next hole, the 376-yard, par-4 10th. Burnham and Miller were the only other golfers to beat par; Burnham's 2-under round of 70 included five birdies and three bogeys. The four-day tournament features a new format this year. 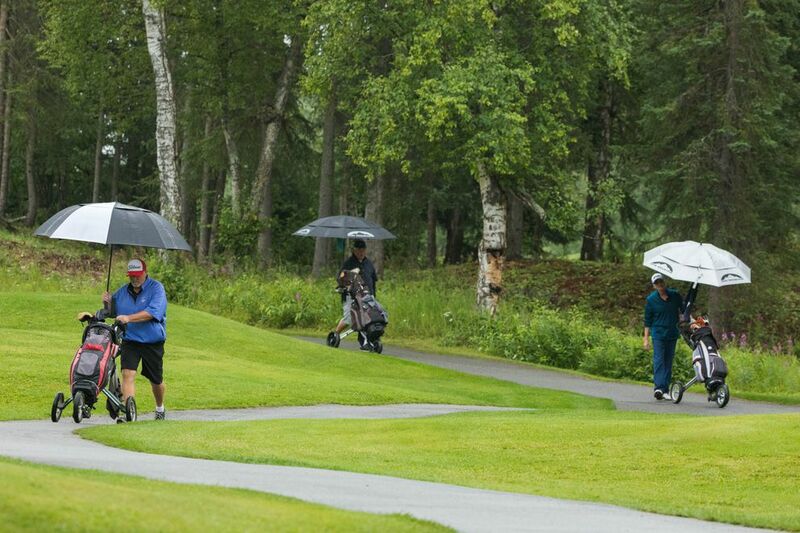 Golfers won't be separated into flights until after Friday's round at AGC. The top 20 will play in the championship flight and the rest will be divided between the first and seconds flights. Women's competition begins Friday with the first of three rounds at AGC. 1) Greg Sanders 67; 2) Craig Burnham 70; 3) Jordan Miller 71; 4) tie, Aaron Roth, Richard Teders 74; 6) tie, Adam Baxter, Kyle Reading 75; 8) Bill Arnold 76; 9) tie, Kevin Daniels, Mark McMahan, Rick Boyles, Jeremy Peters, John Schmitz 77; 14) tie, Dean McVey, Kirk Warren 78; 16) tie, Michael Oldenkamp, Christopher Morin, Larry Furstenberg, Brad Ross 79; 20) tie, Jung Han, Nathan Carr, Kurt Kollmann, Mark Adams 80; 24) tie, Brad Bosshart, Tyler Young 81; 26) tie, Kristopher Wood, Josh Ellis, Briano Molinaro, David Geer 82; 30) tie, Maximilian Escobedo, Dave Kester, Marcus Dolejsi 83; 34) tie, Ryan Kowal, David Bosshart, Bert Verrall, Matt Desalernos 84; 38) tie, Grant Dornan, Nik McMahan, Brody Vecera, Alan Fisher, Trey Miller 85; 43) tie, Harry Weigle, Daron Underwood, Christopher West, Maxwell Blankenship 86; 47) tie, Martin Kwon, Paul Dube, Ian Bruchhauser 87; 50) tie, Garret Stortz, Rene' Alvarez, Sullivan Menard, Bill Preston 88; 54) tie, Scott Woodland, Nicholas Brawner 89; 56) tie, Gary Cox, Nicholas Barnes, Brent Haugen, Gary Petros 90; 60) tie, Wes Masters, Juan Botero, Bender Eric, Michael Gardner, Dustin Day 91; 65) Charles Rehder 92; 66) tie, James Lefavor, Jim Waugaman 93; 68) Richard Haller 94; 69) tie, Casey Bieber, Tim Wesenberg, David Mathison, Torgeir Robertson, David Cosgrave, Joseph Orley, Justin McGhee 95; 76) Tony Bickert 96; 77) tie, Gerald Lafollette, Timothy Boudreau 97; 79) Carlos Gomez 98; 80) Jeffrey Greenwood 99; 81) tie, Michael Anderson, Frederick Stevens 100; 83) Greg Magee 101; 84) tie, Jonathon Rodriguez, Chad Campoamor, Daniel Andrews, Gary George, Ronald Perry 102; 89) tie, Kyle Garrity, Teddy Thorstad, Stan Mahlatini 103; 91) Andrew Jackson 106; 92) Dennis Bickford 108; 93) Jeff Pifer 109; 94) Michael Stevens 110; 95) Charles Russo 114; 96) Michael Dellinger 129.